The most popular and best-selling "India Small Business Report', you will find various aspects of small business, their role, impact of franchising and organized retail, service sector, consumerism, legendary entrepreneurs, profile on service sector and who worked for others before striking out on his own. The Report is the in-depth study of Indian Retail and Franchising sector as well as of SMEs. The Report is about a particular kind of small business and a particular kind of small business owner. It is often seen the small business owner or manager ignore the books and articles about small business (es) whether these are for them or not. And yet, small business owners build solid companies, provide dependable employment, and are the foundation of good communities. 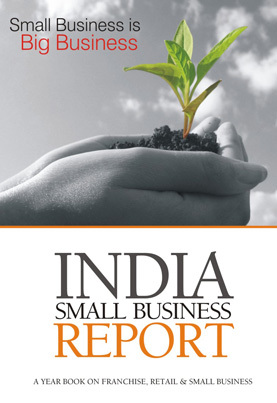 The Small Business Report-2008--a comprehensive picture and guide-brings an authentic updating of Indian Retail, Franchising industry and small businesses in India and is a must buy and read for everyone who are entering the business of retailing, franchising or small business. Today 95 per cent country's industrial units come under Micro, Small and Medium Enterprises (MSME). This sector has around 128.44 units (provisional 2006-07), registering a growth of 4.1 per cent annually are producing thousands of products. The value of production at current prices is estimated to have increased by 17.9 per cent to Rs. 587,196 crores and the employment is estimated to have increased to 312.52 lakh persons. Run into more than 300 pages, the India Small Business Report presents India's retail and franchise tory in all its colours, consumer spending and modern retail share in all consumption categories, from food to fashion, telecom to hospitality, consumer durables to health and wellness, entertainment, India Small Business Report is an ultimate guide to the business of retail and franchising in India. The Report is divided into three sections, starting with demography trends and economic environment for small business; detail accounts of small business in 12 identified industries and examine the features of 20 noteworthy cities of India and eleven top entrepreneurs of India who started their business as small enterprises and with enormous efforts succeeded to transform them. Small Businesses are the largest contributor to any economy of the world. An estimated 25.5 million small businesses in US represent about half of its output; employ about half of the private sector work force (small businesses represent more than 99 per cent of all employers in US), fill niche markets, increase competitions, and generate a majority of American innovations. The growing perceptive image of India as a large industrial hub sometimes overshadows the valuable contributions that small businesses make. Small business sector in India, still trying to match its developed counterparts is one of the most vital sectors of the Indian economy in terms of employment generation, the strong entrepreneurial base it has. Today, the Government's concern for the well-being of small retailers losing their existence in the wake of organized retail happening in India is not ill-founded as the joy that small businesses bring to the world is what makes day to day living worthwhile. With a population of 1108 million people at present to 1269 million by 2016, the country's economy is booming with the proliferation of entrepreneurial opportunities and free enterprise. With the 1991 reforms, there emerged a new India, an India of new ideas and vision for its future. This India was a hub of business possibilities and innovation. There were technocrats, IT professionals, educated and not so educated but enterprising people all waiting to venture in to the new market arena. Thus was born the new India. The Indian Services sector is one of the most significant sectors of the economy contributing nearly 55 per cent of the GDP in 2006-07. This sector has come to play an increasingly dominant role in the economy accounting for 68.6 per cent of the overall average growth in GDP in the last five years between 2002-03 and 2006-07. The services sector continued to record double-digit growth in the current fiscal with a growth rate of 10.6 per cent during the first quarter of the current fiscal year. In 2006-07, the industrial sector grew by 11.3 per cent, while the services sector grew at a rate of 11 per cent. A mere $50 million industry in 1989, it is projected to grow to $87 billion (a fifth of India's current national income) by 2008. Today, there is hectic activity in the Retail sector in India in terms of expansion, entry of international brands and retailers as well as focus on technology, operation and processes. India's increasingly affluent middle class of around 300 million consumers has made it the accelerator of great Indian retail gold rush. There are over 15 million retail outlets spread across India, earning the country an epithet - "Shopkeepers' Nation." More than 80 per cent of these 15 million outlets are run as small family businesses. Most of these businesses in India's are in the business of retail. The striking feature of today's Indian retail scene is the duality which has lately emerged, forming the basis of modern and traditional retail in India. However, small traders, comprised of traditional retail, have conspicuous presence controlling 96 per cent chunk of the retail sector and the ingress of large corporate and foreign retailers has made them occupy 4 per cent of retail segment introducing modern retail in the Indian market. Corporate retailers, however, plan to augment the share of modern retail from the current 4 per cent to approximately 15 per cent-20 per cent in the next four years by investing more than US$25 billion. Each consumer in India will spend over Rs. 200 a day, on an average, by the year 2025, steered by a ten-fold increase in the country's middle class population and a three-fold jump in household income during this period. This churn in consumer spends will largely be driven by preferences that the younger sections of the population exhibit. This could create the perfect opportunity for new consumer-centric organizations. More young consumers, greater incomes, global aspirations and a greater propensity to spend-all of this have marketers excited. To woo this young consumer, marketers will be forced to make many changes. While small retailers need to upgrade and innovate their operating systems to meet the needs of this consumer, modern retailer need to bring the same level of service which is given single unit retail store which is not easy. In the US, almost a third of the retail sales come from franchised business as 50 per cent of retail is franchised there. Franchising is a powerful economic engine and a sophisticated entrepreneurial alliance through which business investors can create vast wealth and a perfect solution for business owner in unorganized sector of India to upgrade him to a next level of success. In US, there are over nine lakh franchised outlets with sales exceeding a 1.5 trillion dollars while back home, this industry is around one billion dollars.